Expose Risks & Protect Your Network. Enterprise Endpoint Visibility (EEV) is essential to eliminate blind spots, expose risks, and protect your network. TYCHON addresses the challenge facing most enterprises to get this visibility in real-time while balancing reliable, relevant data with a scalable architecture. 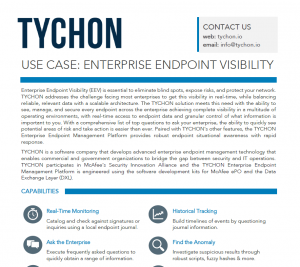 The TYCHON solution meets this need with the ability to see, manage, and secure every endpoint across the enterprise achieving complete visibility in a multitude of operating environments, with real-time access to endpoint data and granular control of what information is important to you. With a comprehensive list of top questions to ask your enterprise, the ability to quickly see potential areas of risk and take action is easier than ever. Paired with TYCHON’s other features; custom queries and scripts, endpoint journaling, and interactive dashboards, the TYCHON platform provides robust endpoint situational awareness with rapid response. Using a local endpoint journal, real-time process execution is cataloged and checked against signatures or inquiries. As the journal is populated with file information and process executions this information can be later questioned to aide investigations and forensics in building a timeline of events. Further investigate suspicious results through robust custom scripts, fuzzy hashes, advanced questions, and WMI queries. Schedule key questions to reoccur so that analysts and operators can be freed up to perform hunt operations and defend the network. With the TYCHON Automated DoD Cyber Hygiene Scorecard user logins, Windows patch status, system configuration compliance, and web server compliance are automatically reported back and presented in an easy to consume interface. Query endpoints using plain language questions to access asset inventory, utilization data, and more. Scan and report on asset data with little to no network impact. Create custom query and remediation scripts. Access near real-time data on patches, versions, login statistics and other compliance metrics. Why Tychon? We’ll tell you why.